The ranges of products also includes Air Curtains, Insect Killers, complete range of Stainless Steel Dust Bins, Washroom Hygiene products, Stainless Steel Railings etc. & all type of St. Steel fabrications along with s. s furniture / fixture etc. We have established a state-of-the-art infrastructure to manufacture our products in compliance with international quality standards. Backed by this advanced facility, our professionals are capable of meeting bulk and urgent requirements in a timely manner. Also, we can manufacture the offered products in customized specifications as per clients’ exact requirements. Stringently tested on well-defined parameters, the offered products are assured of high quality and performance. These are offered at market leading prices and are extensively demanded in Hotels, Restaurants, Catering units and other Commercial Kitchens. Also, our ethical business practices, timely delivery and easy payment modes help us in attaining complete client satisfaction. 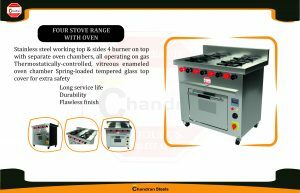 To meet excellent quality standards, we are offering a quality range of Four Burner Cooking Range with Oven. The Four Burner Cooking Range with Oven we offer is made accordingly as per clients needs. These Burners with oven is used mostly in the Hotel, Restaurant, etc. where we known to provide them in wide range.